← Enjoying Our Sumo Sam Dinner! 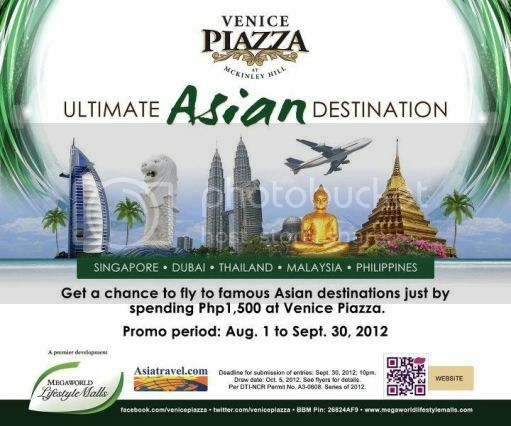 Join Venice Piazza’s Ultimate Asian Destination Promo! Do you want to travel to Singapore, Dubai, Thailand, Malaysia or the Philippines for free? Well, you can do just that by joining Venice Piazza’s Ultimate Asian Destination Promo! Every Php1,500 worth of single or accumulated receipts from any establishment in Venice Piazza, Woodridge, One World, Three World, 810 Building and 820 Building entitles customers to one (1) raffle stub that they need to fill out with the following information: complete name, complete address and contact number. They should also affix their signature to qualify as a valid entry. Raffle stubs can be dropped at the designated drop boxes. Deadline for the submission of all coupons is at mall closing hours on September 30, 2012. Nine (9) winners will be drawn and will be notified through registered mail from Megaworld Commercial Division. You may visit their website to view the complete promo mechanics. For more information, please call the Megaworld Lifestyle Malls Concierge at 709-9888 or 709-0888, 0917-83830111 or log on to www.megaworldlifestylemalls.com. Like them on www.facebook.com/eastwoodcity and get your quick updates by following twitter.com/eastwoodmall. You can also download the Megaworld Lifestyle Malls App on your iPhone or iPad now available at the Apple App store. Promo period is from August 1 to September 30, 2012. This entry was posted in Venice Piazza's Ultimate Asian Destination Promo. Bookmark the permalink. 2 Responses to Join Venice Piazza’s Ultimate Asian Destination Promo!